Taking a supplement contaminated with a banned substance might cost you your job or impact your health. And if you're dialing in your nutrition to the gram, you need to be sure that what's on the label is what's in the supplement. Here's how a 175-year-old company is making sure your supps are safe and contain what they claim to! Drug testing may make the biggest headlines when an athlete fails one, but it's relevant to all of us. Testing is a regular practice among government agencies and many employers. Consumption of a supplement tainted with even the tiniest amount of a banned substance can have dire consequences—no matter if you play tight end for a pro football team or work as a security guard at the local mall. If you test positive for one of these substances, you can claim ignorance, but the consequences may be the same whether you knowingly took it or whether a speck of the banned substance inadvertently fell into a batch of your protein as it was being manufactured. Today, nearly 70 percent of all Americans and 12 percent of all American children take dietary supplements. As usage has increased, so has concern for the purity of these supplements. This trend has thrust companies that test for banned substances into the limelight. The Laboratory of Government Chemists (LGC) was the original substance-testing organization, dating back to 1842 when it was created to regulate the adulteration of tobacco in London. The agency quickly expanded to test for everything from the use of red lead to make cheddar cheese more orange, copper to make pickled vegetables greener, and various performance-enhancing substances to "juice" race horses, racing dogs, and even racing pigeons. More than 175 years later, LGC has evolved into the for-profit supplement testing agency Informed-Choice (and its sister agency Informed-Sport), which over the last 16 years has become by far the world's largest laboratory testing supplements for contamination by banned substances. To get the inside scoop on the evolving business of supplement-purity testing, we talked with Andy Holmes of Informed-Choice's Standards Division. How Do Supplements Get Contaminated? Holmes says that when the company first became active in the nutrition products market, manufacturers and retailers of these products "didn't really see a need for [testing]. If there wasn't a banned substance on the label, then how could it be in their product?" As such, LGC's primary work involved performing advanced testing for substances banned by the World Anti-Doping Agency (WADA). But what these companies didn't understand at first was that after endless contamination scares, consumer trust in companies associated with food or drug production had plummeted—and it wasn't necessarily because they thought these companies were purposely "doping" their nutrition products. "For example," says Holmes, "suppose a company that manufactured the ingredients for protein powder also manufactured cold medicine, and that their cleaning procedure involved little more than getting an air hose out and spraying down the tubs they used to mix both the protein and the medicine. You don't need to be a rocket scientist to imagine how traces of the cold medicine could get into the protein powder. I'm not saying this kind of thing happens all the time, but it is well within the realm of possibility." 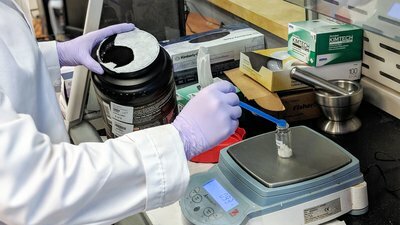 Informed-Choice is one of just a handful of labs around the world capable of testing for banned substances and contaminants, and to do so in the range of parts per billion. "You may ask whether this kind of purity really matters to the regular consumer," Holmes says. "The fact is, millions of people every day are subject to drug testing as a condition of being hired. When police officers are involved in a car wreck or a shooting, they're immediately drug tested. The same is true EMTs and firefighters. And members of the military are subject to random drug testing." For site certification, Informed-Choice literally swabs down entire manufacturing facilities, taking samples at those points in the process where the product could be contaminated. For finished-product testing, Informed-Choice tests samples from both the retailer's inventory and from store shelves. It will also review, in depth, the standard operating procedure a company uses to manufacture raw ingredients or mix supplements. These facilities are audited beyond Good Manufacturing Process (GMP) standards, taking into account the anti-doping measures Informed-Choice has developed to mitigate risk. This banned-substance testing in 50,000 times more sensitive than GMP regulation testing. In addition to potential disqualification for sport or employment, ingesting contaminated supplements can have a huge impact on people with physical illness. When it inspects supplements, Informed-Choice looks for contamination from all types of steroids, as well as methamphetamine-type compounds and stimulants including DMAA, PMBHA, ephedrine, oxilofrine, and the anti-asthmatic medicine, higenamine. Informed-Choice pays attention to a long, long list of threats so the rest of us don't have to. "Would the presence of a methamphetamine compound be a good thing for someone taking heart medication?" Holmes asks rhetorically. Holmes says the market for supplement testing is now being driven by manufacturers and retailers who see the wisdom and the competitive advantage of being able to certify that their products are free of banned substances. This is an incredibly complex process that takes a long time, and delays the launch of new products. But now more than ever, supplement companies are realizing that when consumers can choose between supplements that have been tested for banned substances and those that haven't, it's really no choice at all. "Customers want this kind of testing," Holmes says. "People will pay top dollar for their supplements, as they will for high-quality meats and vegetables, because they care about what's going into their body. Just like other organizations certify that a food is organic or gluten-free, Informed-Choice's certification assures consumers that the nutritional supplements they choose are safe for themselves and their children." Holmes says Informed-Choice tests about 18,000 samples a year for contamination by banned substances. It verifies that testing has been done on products to make sure that the nutrients the label says are in the product are actually there—and in the amounts stated on the label. And it verifies that products have been tested for heavy metals and other contaminates prior to being tested for banned substances. If you follow Informed-Choice on social media (@trustedbysport), you'll see that each week the company posts a number of newly certified products, or new versions of supps you may already be familiar with. To make this information more accessible, Informed-Choice is releasing a mobile application early in 2019 that will enable shoppers to check the certification of nutritional supplements of more than 220 Certified Sports Nutrition brands around the world. Until then, you can also use Informed-Choice's Certified Product Brands database to search for certified brands and products, or to see if a certain batch number of the supplement you purchased meets certification standards. "Informed-Choice's goal," Holmes says, "is to help people understand the value of choosing products certified as having been tested for banned substances. Ultimately, we're here to improve overall supplement safety in the global marketplace."